Traditionally, gas turbines have been used in the power and oil and gas industry, often in remote areas, where the main objective has been to protect the turbine from injection of larger particles, which could cause erosion and wear, jeopardising engine reliability. With the increasing demand of power, gas turbines are increasingly being used as a local power source in combined heat and power (CHP) and combined cycle gas turbine (CCGT) plants in our growing cities. The urban environment exposes the gas turbine to a new and different manmade environment, with pollutions and particles which is much more challenging to remove. Cars, trucks and other combustion or industrial processes generate a high concentration of small sub-micron hydro carbon particles which, if not removed, will change the shape of the rotating and stationary vanes of the compressor. It results in a reduction of both mass flow and pressure ratio generated by the compressor and is normally called fouling. The net result of fouling is a reduction of power output and an increase in heat rate for a given combustor outlet temperature - conversely if an engine is not running at its temperature limit, a fouled engine has to run hotter to produce a given output. 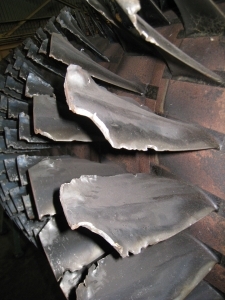 A secondary effect of fouling is an increase in airfoil temperatures in the high pressure turbine, as fouling in the internal vane and blade cooling passages reduces heat transfer effectiveness and ultimately reduces the life of the hot section. If not removed by the inlet air filtration system, the particle injection will force the operator to frequently water wash the compressor section either by temporal on-line washing or more efficiently during shut-down. But fouling is costly, either due to the loss of power, the 'extra' fuel cost and/or the necessary stand still for water wash or other maintenance work. Operators are now becoming increasingly aware of this situation and tend to request filter systems that better protects their gas turbines and makes sure they can operate at designed efficiency for longer periods without unplanned shutdowns. Gas turbine inlet filter systems have during the past 10-20 years typically been designed with G4 pre-filtration and F7-9 (EN 779) final stage efficiency in static systems. This has provided an acceptable engine protection for many installations, but with an increasing use of gas turbines in urban environments engine degradation is sometimes rapid and water wash cycles is often reduced to few hundred hours. Consequently, what is needed is better efficiency in removing small sub-micron particles, which mean minimum F9 efficiency or preferably stepping up to the EPA class range from E10 to E12 (EN 1822), which has a dramatic effect on engine fouling. For example, by going from the typical F8 grade to E12, penetration of 0.4 micron particles is reduced from typically 30 per cent for a F8 filter to less than 0.5per cent in a E12 filter. This is a huge improvement which cuts fouling dramatically. With E12 efficiency we have taken the step into the "clean-room" world which gives operation periods of 2-3 years between shutdowns. But even taking the step to go from the F8/9 'standard' to the today very common E10 is a huge improvement for the operator. - The costs of fouling far exceed the cost of eliminating it. 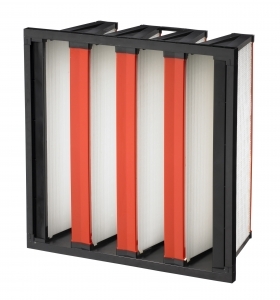 - There are proven filter systems on the market that allows GTs to operate 2-3 years without shutdowns at maintained efficiency. - The complete system has to be reviewed including weather protection, prefiltration and tightness of frames and housing.